the Northern Worker: Demilitarize the Police! 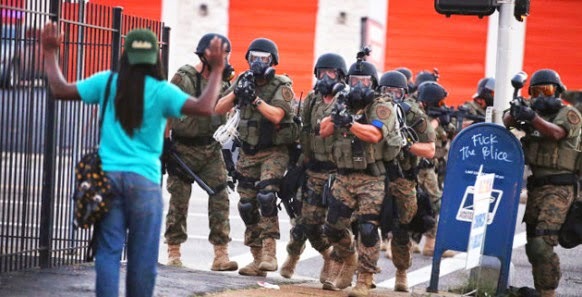 The military weapons we saw on display in Ferguson, Mo., are part of the militarization of police forces across the U.S. In 1997, the Clinton administration passed the “1033 program,” which allowed for surplus military equipment to be issued to local police departments, including college campus police. Another impetus was the tragic 9-11 attack. Today, under Democrat Barack Obama, the program has mushroomed with grants from Homeland Security, the Justice Department, and the Pentagon. Such equipment has included M-16 rifles, high-powered .50 caliber rifles, full body armor, and the BearCat armored truck seen in Ferguson. Since its start, the 1033 program has transferred more than $5.1 billion worth of equipment. In 2013, under Obama, $450 million worth of property was transferred to law enforcement agencies. More than 8000 law enforcement agencies have enrolled in the program. On Dec. 1, Obama affirmed that the 1033 program would continue. According to Peter Kraska, a professor at Eastern Kentucky University’s School of Justice Studies, SWAT teams have skyrocketed in use from a few thousand instances per year in the 1980s to more than 50,000 per year in 2005. The numbers are expected to have risen since then. The majority of SWAT raids were used to serve warrants against non-violent drug offenders. A state investigation in Maine found that in some areas 100% of warrants were carried out by SWAT teams, regardless of the suspected crime. Some 90% of large cities now have SWAT teams as well as 80% of small towns. Glen Ford, editor of the Black Agenda Report, summed it up this way, “Since President Obama took office, the Pentagon has transferred to police departments tens of thousands of machine guns; nearly 200,000 ammunition magazines; thousands of pieces of camouflage and night-vision equipment; and hundreds of silencers, armored cars and aircraft. > The article above was written by Marty Goodman, and is reprinted from Socialist Action newspaper.